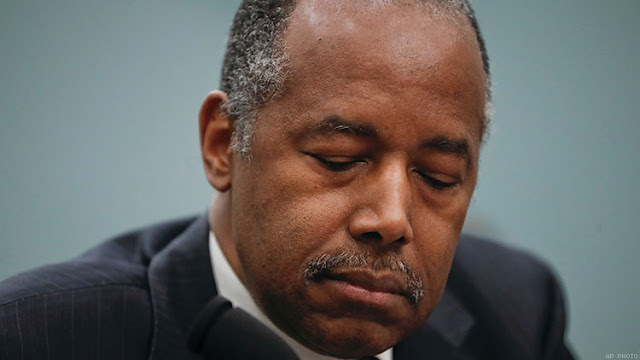 A third of Housing and Urban Development (HUD) Secretary Ben Carson’s appointees at the highest levels of the department have no experience with housing policy, according to an analysis by The Washington Post. Twenty-four of the 70 people hired to the top positions at HUD under Carson apparently have no housing policy experience, according to the Post's analysis of their résumés and LinkedIn profiles. However, 16 of them appear to have worked on Carson’s or President Trump’s 2016 presidential campaigns or maintain close personal connections to their families, the Post reported. In a statement to The Hill, Caroline Vanvick, a spokeswoman for HUD, wrote that the department's senior appointees "have well over 100 years of housing and mortgage policy experience combined." Vanvick listed 10 officials who have a background in housing policy, including Deputy Secretary Pam Patenaude, who has led national housing initiatives. HUD spokesman Raffi Williams in a statement to the Post wrote that hiring people with "varying experiences to government is not unusual" and pointed out the majority of the top appointees do have housing experience. The Post found that five of those appointees without housing experience received promotions and significant pay increases within their first months on the job. All of the five appointees now make between $98,000 and $155,000 per year and worked on either Carson's or Trump's presidential campaign. American Oversight, a watchdog organization formed to scrutinize the Trump administration, obtained the documents cited in the Post's analysis through the Freedom of Information Act.